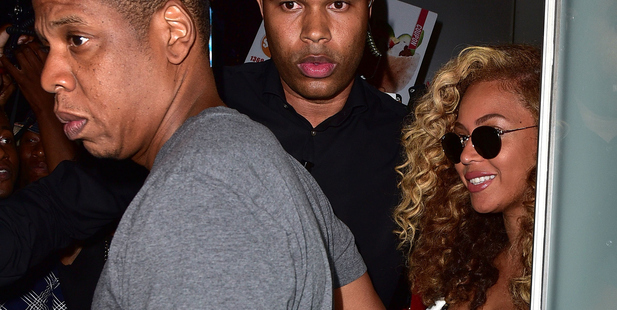 Jay Z and Beyoncé are reportedly expecting a baby. The couple - who already have three-year-old daughter Blue Ivy together - are feeling incredibly "lucky" over their apparent impending arrival. A source said: "They've been trying for a while, and it was so hard when it wasn't happening. They both desperately wanted another child and feel so lucky. But they definitely won't tell everyone with just a statement - that's not their vibe." And the Drunk In Love hitmaker is also believed to be worried about "jinxing" things by revealing they are expecting ahead of the first trimester. A source added to US' OK! magazine: "Even though she's barely showing, she's paranoid that someone will pick up on it, so she's hiding her stomach whenever she goes out. "They've gone through so much to get here that they don't want to jinx it by telling everyone before the three-month mark. They'd love to involve Blue, because they know how much she wants a little brother or sister." Meanwhile, an insider previously claimed the couple were not rushing into a second pregnancy. The source said: "So, Jay and Bey are not rushing into things because they feel like they are still young and can put it off for a bit! They had been trying but settled down, because they are so busy with their careers and parenting Blue as it is."